The Qashqa’i confederacy is the largest group of nomadic pastoralists in Southwest Iran. The Qashqa’i are famous for their prolific output of pile rugs, bags and weft-faced gelims. Little attention has been paid to their warp-faced weavings that were utilitarian and were not woven for commerce. These textiles include bands used to carry loads on pack animals during migration, decorative animal bands, covers for various uses and numerous types of containers. The structure and use of these weavings are the focus of the lecture. Examples of Qashqa’i warp-faced weavings will be shown and the audience is invited to bring in examples. Fred Mushkat graduated from The Ohio State University in 1972 with a B.S in Computer Science Engineering. He received an M.D degree from Ohio State in 1976. After a residency at the University of Cincinnati, he has been a practicing emergency physician since 1979. His interest in textiles began in 1977 when he began going to yard sales and finding an occasional Oriental rug. Like many people at that time, he became interested in “ethnographic” textiles and focused on non-commercial weavings made by nomads. 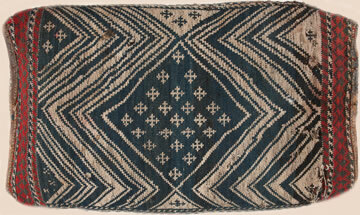 Warp-faced weavings had these qualities and had been largely ignored by the trade. He began collecting bands in 1986. He published articles on warp-faced bands in HALI 84 in 1996 and HALI 188 in 2016. In 2001, he curated an exhibition of warp-faced bands from Iran at the American Conference of Oriental Rugs (ACOR) in 2001. Two of the other exhibits from that Indianapolis ACOR have been published with his photographs. His photographs also appear in HALI 189. He is in the final stages of completing a book on these textiles, to be published in 2017 by HALI publications.